UPDATED: Thu., March 22, 2018, 3:49 p.m.
BOSTON – Sporting the No. 1 seed in the NCAA Tournament’s chalkiest region doesn’t give Villanova coach Jay Wright any special confidence heading into Friday night’s game against West Virginia. The Wildcats were together in a Pittsburgh hotel room last weekend when they watched top overall seed Virginia’s unprecedented first-round loss to No. 16 seed University of Maryland-Baltimore County. When it was over, there was no need for Wright to harp on the lesson. “It was so impactful that you didn’t have to say it,” he said Thursday as Villanova hoped to avoid joining the slew of deposed favorites when it plays the fifth-seeded Mountaineers for the East Region’s spot in the national quarterfinals. Along with Kansas in the Midwest, Villanova is one of two No. 1 seeds remaining in this year’s bracket. Joining the Wildcats and Mountaineers in Boston are second-seeded Purdue and third-seeded Texas Tech. Each of the other three regions has at least one team seeded ninth or higher; none of the top four in the South is still playing. 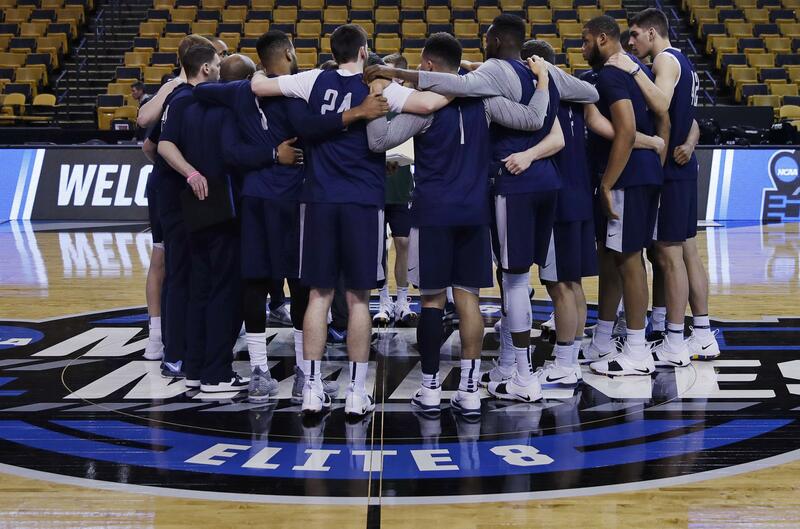 Villanova (32-4) and West Virginia (26-10) will meet in the early game in Boston, where both teams were frequent visitors in the original Big East. Purdue (30-6) and Texas Tech (26-9) will play in the nightcap. With all those low seeds in the tournament, West Virginia doesn’t seem like much of an underdog. But the Mountaineers are hitting that angle hard, saying they don’t get the respect they deserve as a senior class that has reached the Sweet 16 three times in four years. Coach Bob Huggins, who is seventh on the NCAA’s all-time victory list, said the lack of hype goes back to when his players were recruited. Rather than guys with the potential to go to the NBA after one year, he has to pick the ones who might otherwise attend a mid-major school. The Mountaineers rely on a stifling full-court defense that has earned them the nickname “Press Virginia.” Villanova’s ability to pull up for 3-pointers in transition is seen as the key to breaking the West Virginia pressure. Texas Tech’s Chris Beard made it a point to watch the video of the last time he faced Purdue, when he was coaching Arkansas-Little Rock and it upset the Boilermakers in the opening round of the 2016 tournament. Purdue’s Matt Painter doesn’t need a reminder, thank you. Purdue is expected to be without Isaac Haas, who broke his elbow in the second half of the first-round game against Cal State-Fullerton. The 7-foot-2, 290-pound center has been trying to get back onto the court, but Painter said it’s unlikely he will play. Published: March 22, 2018, 3:47 p.m. Updated: March 22, 2018, 3:49 p.m.